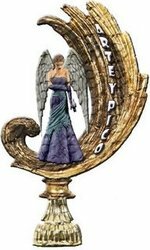 I absolutely LOVE the Stampin' Decor line from Stampin' Up! I think it is a brilliant idea, and have bought 5 different ones to put up in out home. Here is the newest addition to my growing collection. I got a piece of MDF, and got it cut to 20 X 20. I used the Together Forever Frame and the letter B(umm, duh). It will not be staying above the fireplace, it will be on the wall above my couch, with black and white photos of us around it. I will post a picture when it is all finished. Have fun decorating!! ETA : MDF is medium density fibreboard, and I painted the wood side black with acrylic paint. I then sprayed on a sealer, to keep the paint from being scratched or chipped. This is actually how we heat our home. This is ducted right into our furnace, so the whole house stays toasty warm! A lot of people thought our fireplace was just a feature wall, and while it is that, it is also the most beautiful way to keep warm. I can hardly wait to set up my Christmas tree, turns the lights off and sip some hot chocolate next to a glowing fire. I hope to make some new traditions like opening presents by the fire, and then roasting some marshmallows ... hehehe. 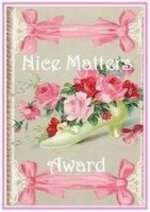 Well, time to stoke the stove, have a great evening, and reminisce on some warm, happy memories. Dylan and Jayden wanted more platz, AND they wanted to help. 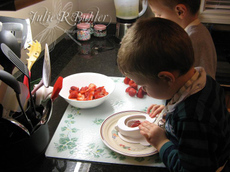 I cut the tops off the strawberries, and they took turns slicing them. I love my little slicer, it is for eggs, mushrooms, kiwi, etc, and it is safe for little hands, since there is nothing sharp on it. Between the two of them, they sliced up 2 lbs of them! 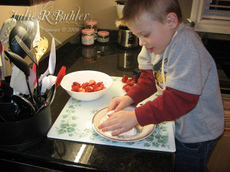 While they finished slicing, I mixed up the base, and then they got to spread the strawberries on top. 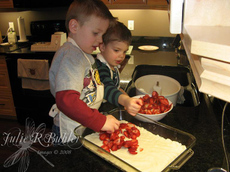 I baked it while the were getting ready for bed, so today, they are pumped for some Strawberry Platz. I used the full 2 lbs. for my cake, since I wanted a thicker layer of strawberries. I am staring at it right now on my counter, and if I don't go stamp soon, I am going to eat it ALL!! More Q and A With Julie, and House Tour #3!! WOW - the questions have been rolling in, about the house and the Cuttlebug Ink Emboss, so here you go with the most asked questions. 1. What is the name of the paint in your family room? 2. What kind of floors do you have through the main area? We have hardwood flooring on almost the whole main floor (helps with allergy issues). 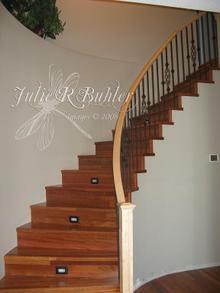 It is called Jatoba, or Brazilian Cherry, one of the HARDEST woods out there. In our other house, I dropped my dutch oven on it, and it didn't even dent - how awesome is that ?!?! 3. What are the little things on your stairs ? They are LED lights built into the steps. If we left them all all the time, it would take 20 years to burn out, AND the only use 1/3 of a watt. This is really nice for me, to not have to turn on all the lights when I need to go upstairs to check the boys at night. We also have them on the steps going into the basement. 4. Can I move in with you ? Umm, no! But I wouldn't mind if you wanted to come stamp with me sometime...hehehe. 5. Can your hubby build my house too? 6. 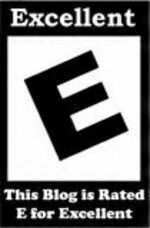 What kind of ink can you use with the Cuttlebug Ink Emboss technique? 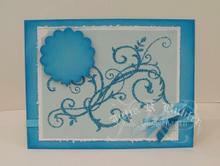 I used Classic ink from Stampin' Up!, but you can use anything. I myself wouldn't use any type of solvent ink, since it would probably stain, but craft and chalk ink would be fine. 7. Can you make a template / tutorial for the box of the gift set HERE? This is the front entrance. We had an UNBELIEVABLE tile guy come in. He was only 26 years old and had been laying tile for 13 years. Yes, that does make him 13 when he started. His story totally broke my heart, his parents abandoned him at that age, and since he wanted to eat, he got a job. He has been doing this for half of his life already, and it shows, he has an eye for it like no one I have ever seen! Russ made sure that he will have ALL our tile jobs from now on. The door on the left is the one that goes into Russ' office. So now, you have basically seen everything in the house, I hope you enjoyed the tour! 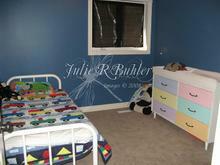 This is Jayden's and Dylan's bedrooms, and they are side by side, exactly like this. 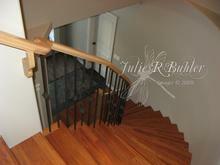 The are up the curved stairs in the front entrance. Jayden still has a toddler bed, and it looks so small in his room...LOL. They are both getting new furniture, though, since Dylan's dresser is still perfect for the baby that he was. This is the only other room upstairs, and yes, it is HUGE. 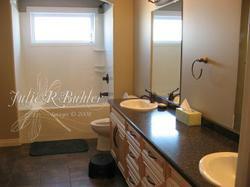 It was totally a mistake, with the framers, since the sinks should have been side by side. That is how much smaller the room should have been! 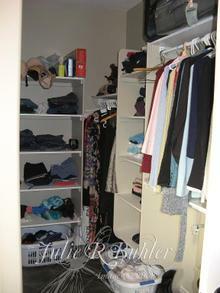 On the opposing wall (not shown), there is a linen closet for the boys sheets and towels, and cleaning supplies. This way I won't have to climb stairs anymore than I already do. 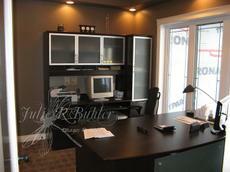 This are the only rooms that are upstairs, only about 600 square feet, but at least they have their own space. This way too, they will never have to move into the basement, since this floor is all their own! This is what you see right when you walk in our room. Don't you like the fireplace mantle above the bed?? That was supposed to be in the family room, but it was too small, and instead of throwing it out, we decided to use it. I still have to find something a it more substantial to put on it, but I really like how it turned out. 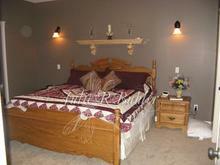 The lights on each side are instead of table lamps, and are on dimmers *for mood*...hehehe. On the right, across from the bed, you go into our en suite. 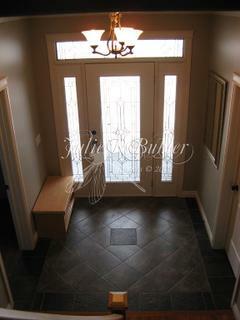 The picture is taken from the other end of the bathroom, where the door is to go outside to the HOT TUB!! This closet is all mine - YAY!! My hubby just has two bars on the right side in the picture up above. The other is our vanity one side for my make-up and hair stuff, and the other for the sink. 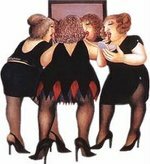 This was we can both get ready at the same time, and not be fighting for mirror space. I have a few more rooms to show you. so keep checking back!! OK, I have to do this in parts, since I don't have time to clean up every room in a day, just to take pictures. I have 2 little boys that love to run behind me messing it up, and I only have so much patience to play that game...hehehe. 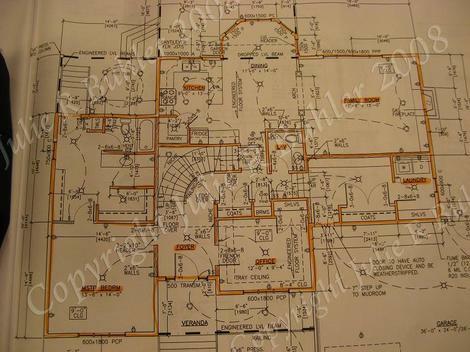 First, I am going to show you the house plan, so you know kinda where I am taking pictures. It'll almost be like you're here!! 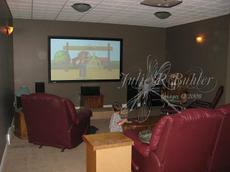 In the plan, these photos are of the Family Room. I LOVE the fireplace, and the wall unit. This is were we will spend a lot of time visiting. It is really nice, since the guys can be in here, while the women chatter in the kitchen. When you go between the china cabinet and the kitchen, turning left, you go to our mudroom/ laundry. This is heated tile, so it is nice and warm. 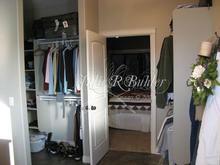 The double doors on the right is closet (I HATE SLIDING DOORS), and the door at the end goes into the laundry area. We didn't want to pay for the steps for my washer and dryer, so Russ built a platform to set them on. 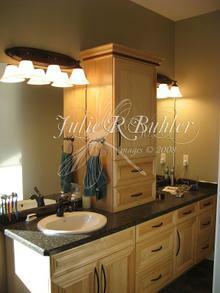 The opposing wall to the appliances, has my cabinetry and a sink for washing hands and soaking clothes. This is something I HAD to show you. I wish I had it in every one of my kitchens. My sister-in-law, had these little extra shelves in her cupboards to hold spices, and when I saw that, I KNEW I would use that. 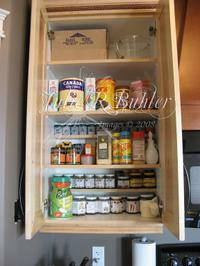 The bottom 2 regular shelves, also have 2 inch or so deep shelves in between, so I can stack my spices on them. I have waaaay more room for my spices now, and it is better organized. They are adjustable, just like the others, so I can move them up or down in between the bigger ones. Hope you enjoyed the house so far, and stay tuned for more rooms soon! You can click on each picture for a larger view. 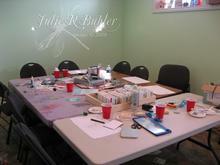 This is the craft room shot, after 10 women came to play with me for the evening. I will clean this up and post better pictures, but I wanted to show you that I got it cleaned up. 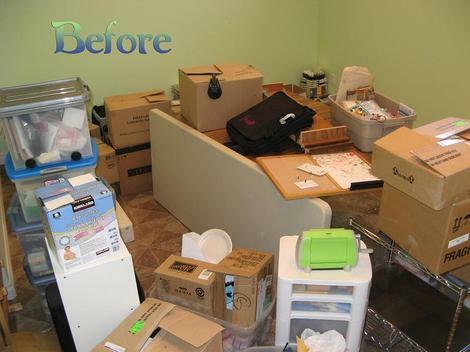 OK - I didn't really, there are still 4 boxes sitting on the floor in our family room that needs to be unpacked...hehehe. This is the card we made for the class. There will be a sentiment on the scallop circle, but I haven't decided what I want yet. This is using my tutorial HERE, with heat and stick powder and the Fine Cosmo glitter. 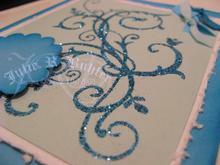 I used soft sky, white and tempting turquoise CS. Then we also made my Post-It Note Holder, HERE. I'll be back soon with some more pictures of the house. Have fun and happy stamping!! Help - I'm Drowning in Boxes!! This is the before shot of my craft room. I have NO idea when the after shot will be, but it better be before Tuesday next week!! I could stamp right now, but I really want to get something done. I will have to stamp tonight, though, to get my color concoction ready for tomorrow, so keep looking for that. Tomorrow is also the day I will have to go through quite a few posts to figure out who won some of my cards. That will be done in the afternoon, whilst the family has their matta schlop (dinner nap). So far, I saw one that was ONLY 2 AWAY from the actual number!! OK - time to get busy. The date has been set - we are moving to our acreage on March 6th!! I have some more pictures for you today, also. I found this out this past Friday, and realized that I only have 2 weeks to pack. Remember that Procrastination story??? Well, I still haven't started packing...hehehe. Any way, on to the pictures. 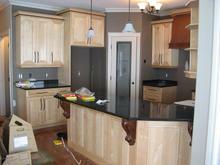 Here is my kitchen with my granite counter tops - Black Pearl I think ?? They are so shiny, but do not show fingerprints, at all!! That is so awesome with 2 little boys running around. 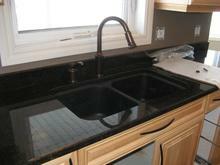 I also have a black granite sink, and I LOVE it. I had one in the house previous to this, and it never showed water spots, so I knew I would have it again. It is a little messy since the electricians were there finishing up. 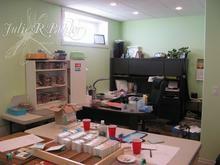 And here is my craft room!! 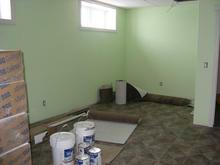 It is a celery color, since this room is in the basement. I wanted it to be a bright room, since most of my classes are in the evening, and it will reflect the light more than a darker color. The painters and the cleaning lady should be done at the end of this week, so I can start setting it all up. I will post some pictures of the final result, and maybe you can come STAMP WITH ME!! This weekend, I won't be stamping. 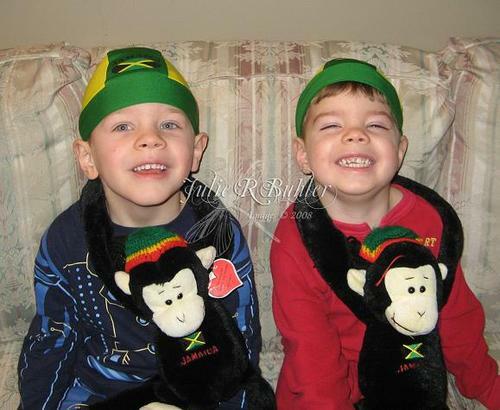 I am going to be spending my time with 2 little boys who really missed their mommy (who really missed them back)! !